(Nanowerk News) Modified viruses that transfer genetic material into cells are attractive as tools for gene therapy, regenerative medicine and vaccination. However, after injecting these ‘viral vectors’ into the human body, contact with serum in the blood may trigger immune and inflammatory responses and compromise in vivo gene transfer. A team led by Shu Wang at the Institute of Bioengineering and Nanotechnology of A*STAR, Singapore, has now designed a new polymer coating that protects viral vectors—making them resistant to serum within the body ("Polyethylenimine coating to produce serum-resistant baculoviral vectors for in vivo gene delivery"). 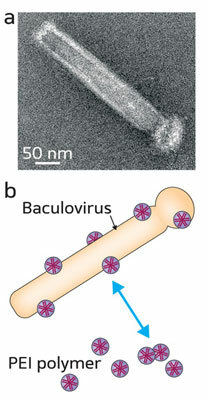 The researchers chose non-toxic, rod-shaped insect viruses called baculoviruses as their vectors. These viruses have been shown to efficiently deliver genes into mammalian cells, but their high sensitivity to serum limits their gene delivery efficiency in vivo. “Previous studies have suggested that modification of viral gene transfer vectors with synthetic polymers is an effective strategy in overcoming barriers to in vivo delivery of viral vectors,” says Wang. The researchers first determined that the surface of the baculovirus was negatively charged under normal pH conditions. Noting that other viral vectors modified with positively charged polymers exhibited enhanced gene transfer, Wang and his co-workers picked the polyethylenimine PEI25K—a positively charged polymer often used as a non-viral gene delivery vector—to coat the virus through strong electrostatic interactions (Fig. 1). During the coating experiments, the researchers observed that stronger binding between the virus and polyethylenimine occurred with higher molecular weight polymers. By investigating how the coating affects cell viability, they were able to establish a critical toxicity level for the coated baculoviruses. Wang and his team treated the coated viruses with human or rat serum and exposed them to brain tumor and liver cancer cells. The resulting gene transfer efficiency was about 500-fold higher than for uncoated baculoviruses, indicating that PEI25K had effectively protected the virus against molecules present in serum. The researchers tested the performance of the polymer coating in vivo by injecting PEI25K-coated baculoviruses into immunodeficient mice. They discovered that the gene expression was two-fold higher than for uncoated baculoviruses. Furthermore, after modifying baculoviruses with a cancer cell-killing gene and directly injecting the PEI25K-coated viral vectors into tumor cells implanted in mice, the team observed an inhibition of tumor growth within ten days—demonstrating the potential of this method for tumor gene therapy. The team is currently investigating the effectiveness of this polymer coating in protecting baculoviral vectors against immune responses to expand its use for in vivo transduction and human gene therapy.